SCE Color Scroll displays various, moving colors. This MADRIX Effect is extremely versatile. ▪ Step Width - Defines the number of pixels the effect should scroll/skip in the direction per frame [in % of the Matrix Size]. The default value is 0.01. Valid values range from 0.01 to 100. ▪ Color Width - Defines the width of a single color [in % of the Matrix Size]. The default value is 10. Valid values range from 0.01 to 100. Displacement Distribution - Is only available for Displacement. Is applied in dependence of the direction that is chosen. 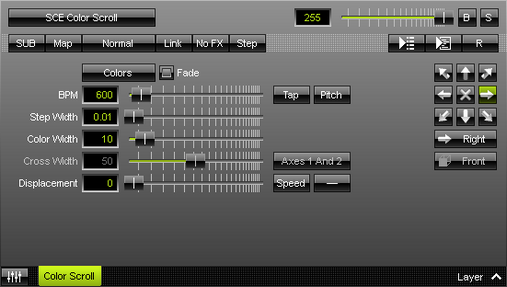 Allows you to choose the area the distortion is applied to [Uniform, Linear Increasing, Linear Decreasing, Triangle]. The default value is Uniform.